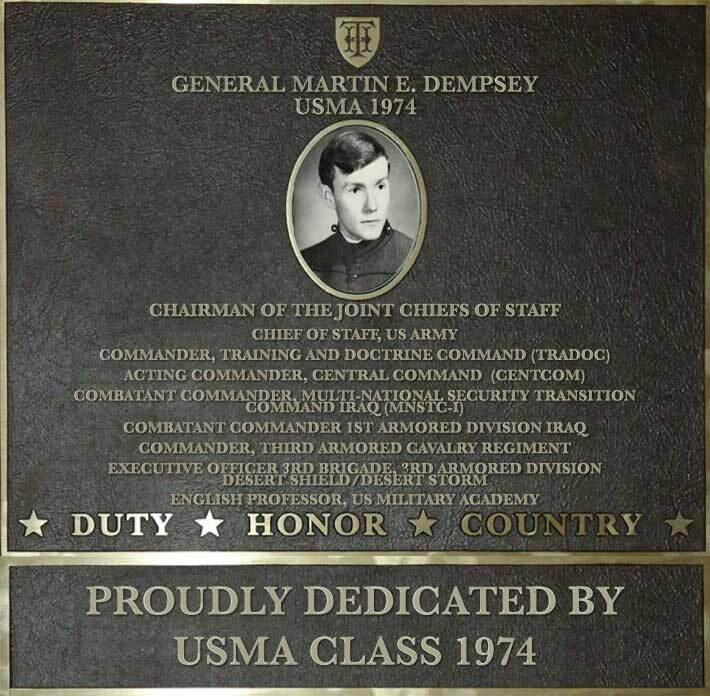 Martin Dempsey entered West Point in the summer of 1970 at the height of the then unpopular Vietnam War. He graduated in June 1974 after US forces had withdrawn from Vietnam. The Army had been battered and worn down after a ten year war in Vietnam and the US military had eliminated the draft, choosing the all-volunteer army in 1973, 2LT Martin Dempsey and his classmates from the Class of '74 would be challenged to lead the army back to full strength at the peak of the Cold War and they would indeed do so. After 37 years he would become the 18th Chairman of the Joint Chiefs of Staff. He married his high school sweetheart Deanie and together they would serve the nation and rise through the ranks together until he became the top ranked officer in the United States military. Born in Bayonne, New Jersey, his family would move to Greenwood Lake, New York when he was in the seventh grade. He would attend John S Burke Catholic High School in Goshen and where he met and started dating Deanie. He chose West Point rather than a full scholarship at Manhattan College. 2LT Martin Dempsey was commissioned as an Armor Officer and attended Armor Officer Basic and Airborne Schools. He and Deanie were married at West Point in the Catholic Chapel. He was assigned to 2nd Armored Cavalry Regiment in 1975 where he served in his first leadership position as a Platoon Leader. He commanded an Armored Cavalry Troop in the 10th Cavalry at Ft. Carson, Colorado, and then attended Duke University to earn his Masters of Arts in English. With graduate degree in hand, he returned to West Point to serve as an Assistant Professor in the Department of English and then attended the Command and General Staff College. He was in Germany as the Cold War ended and the Soviet Union fell, and it didn't take long until rogue states took advantage of the void, and Saddam Hussein invaded Kuwait. Then-LTC Dempsey deployed as a Brigade Executive Officer in the Third Armored Division in 1991 in support of Operation Desert Shied/Desert Storm and was part of the overwhelming defeat of Iraqi forces in 1991. He returned to staff time as the Armor Branch Chief at US Army Personnel Command and after that attended the National War College. He became the 67th Colonel and Commander of the 3rd Armored Cavalry Regiment in 1996. After completing his Regimental Command he was assigned to the Joint Staff as Assistant Deputy Director in the J-5 and as Special Assistant to the Chairman of the Joint Chiefs. He returned to the Middle East in 2001 as the Program Manager, Saudi Arabian National Guard Mobilization Program two weeks after 9/11 and was in the Middle East during the two years following 9/11. He was promoted to Major General and returned to command in 2003 when he took command of the 1st Armored Division in Baghdad, Iraq for fourteen months, as the US military transitioned from direct action to counterinsurgency operations. He redeployed the division to Germany and completed his command. He then returned to Iraq to train Iraqi Security Forces as Commanding General of MNSTC-for twenty-two months. This was at the height of the insurgency and training the Iraqi Army and Police was the highest priority in our counter-insurgency plan. After returning from Iraq he became the Deputy Commander and then Acting Commander of US Central Command (CENTCOM) overseeing both the wars in Iraq and Afghanistan. He then was made Commanding General US Army Training and Doctrine Command (TRADOC). President Obama appointed General Dempsey to become the 37th Chief of Staff of the US Army on 11 April 2011. Only two months later, President Obama appointed him to be the 18th Chairman of the Joint Chiefs of Staff. He assumed that position on 30 September 2011. General Dempsey and Deanie have three children: Chris, Megan and Caitlin, each of whom has served as commissioned officers in the Army and two of whom are West Point graduates. General Dempsey will be the seventh West Point graduate to become the Chairman of the Joint Chiefs. The first Chairman of the Joint Chiefs in 1950 was General of the Army Omar Bradley (USMA 1915). General Dempsey will serve as Chairman of the Joint Chiefs and work with his classmates General David Petraeus (Director of the Central Intelligence Agency) and General Keith Alexander (who leads CyberCommand and the National Security Agency). No West Point class in history has ever held these three positions simultaneously.